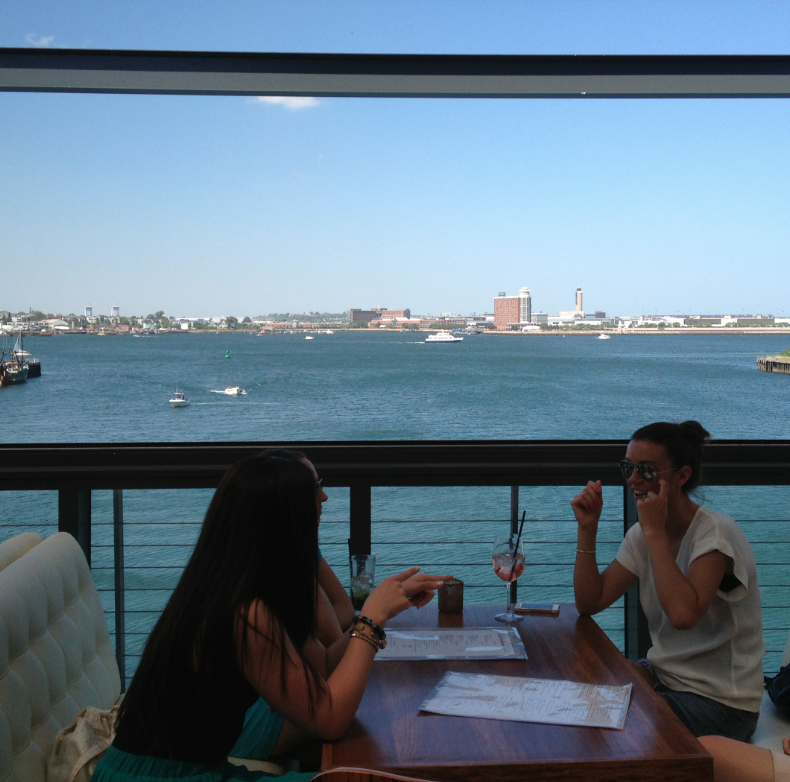 We’ve been away for a few weeks, but prior to leaving we had made a stop at Legal Seafood’s Legal Harborside. We’d heard lots of talk about this place: the view, the party atmosphere, the long waits for service. It’s all true. The view from the roof deck is really great, and you can imagine yourself looking out over mor tropical scenes, but you are quickly snapped back to reality by a low-flying jumbo jet on a landing pattern to Logan, or an LNG tanker heading to Everett. But the view is still pretty nice. Legal Harborside also has some pretty cool mixology going on, and we really enjoyed the Blueberry Thyme Collins. Sorry to say, that’s the extent of our positive comments. We had to do laps around the roofdeck looking for a seat, and were on the verge of leaving when a guy grabbed our attention to tell us his party was leaving. We waited with him, at his table, for probably 20 minutes as he waited for his check. Taking our cue, we ordered drinks and our lobster rolls the first chance we got, but waited for close to an hour for our lunch to be delivered. In the meantime, we saw a guy almost get knocked off the roof by a fly-away folding window caught by the wind, and we observed what seemed a 50-1 customer-server ratio. But the view was nice. Our rolls finally arrived and we were initially pleased by the presentation. 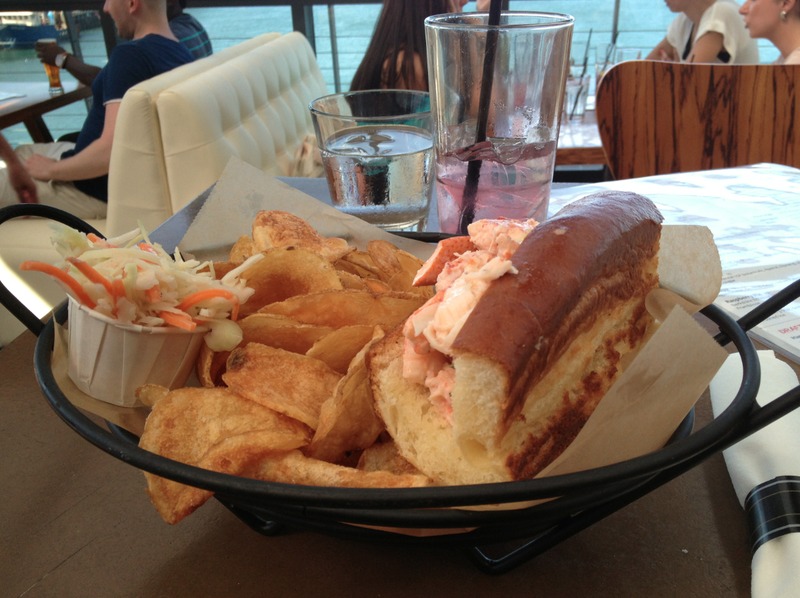 A nicely toasted roll, homemade potato chips and slaw, and some nice looking lobster meat made us forget the wait. After all, the view was nice. But a couple of bites in and we were left disappointed. We should point out that we’re generally happy with Legal Seafoods. Their fish is famously fresh and never frozen. But had we not know this, we would have assumed that this was frozen lobster meat. Instead, we surmised that, since this was a Sunday afternoon, our lobster meat had been prepared the previous day. Now, we’re not saying that’s what happened for sure, we’re simply saying that’s what it tasted like. The roll, although seemingly grilled to a beautiful bronze, had very little in the way of a buttery taste. The homemade potato chips were great, but that’s a topic for some other blog. But the view was nice. 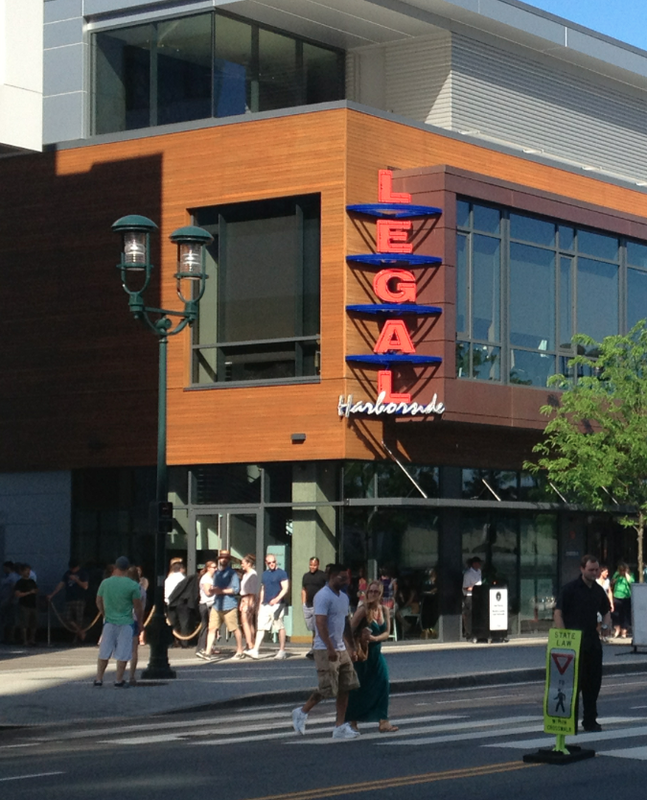 Legal Harborside is located 270 Northern Avenue in Boston, MA. Website: http://www.legalseafoods.com/restaurants/boston-legal-harborside. Facebook: https://www.facebook.com/LegalHarborside. PHONE: 617.477.2900. Disappointing, bland, old-tasting. NOT RECOMMENED.